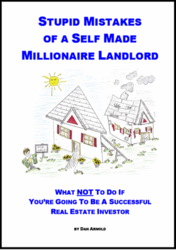 This is a "how to" book from Dan(MA), (who over the years has been a regular contributor to MrLandlord.com) and a landlord who has been investing for over 25 years and continues to make his living from his real estate investments. This is his second book and in it, Dan explains in detail how he goes about finding properties and determining whether or not they are a good deal to purchase. Then he goes into detail about negotiating and what to include in contracts. He finishes out the book with two case studies that show you exactly how two of his deals played out in day by day detail. Price is $39.95. Plus, when you order your "autographed" copy of Making Millions, One Deal at a Time, it comes with Dan's personal spreadsheet for evaluating properties. This is an absolutely free download, with web address to obtain it included with book. You can order this new 156 page book now through this website for $39.95, with free shipping.